Got ugly kitchen cabinets? 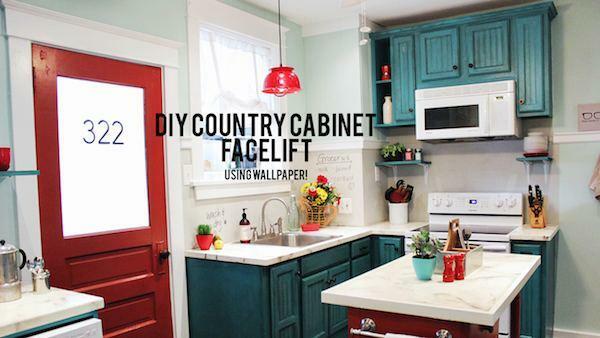 New ones can cost thousands, but here's how you can DIY the look of country bead board cabinets for practically nothing with bead board wallpaper, paint and glaze! 1. Remove all cabinet doors, drawers and hardware. You can leave the cabinets frames in place, unless you're moving the cabinets around. We kept the layout of the cabinetry the same, so left ours in place. 2. Lightly sand the surface of every door front and drawer, making sure to remove as much glossiness as possible. Wipe down with a damp cloth. Do the same to the backs as well. 3. Set up your wallpapering supplies on a large table. Determine the length and width of the panel by laying one side of the wallpaper into the inset panel, flush against the frame and then marking the other side with a pencil. Do this for the length and width. Using a razor blade and the straight edge, make a cut both vertically and horizontally on the wallpaper. Slide the cut piece of wallpaper into the inset panel of the cabinet to make sure it fits. If you cut it correctly, the wallpaper should fit snugly into the space. Trim any excess with the razor. 4. Flip the wallpaper panel over and run the wallpaper paste along the back, making sure to cover the edges, as well. Lay the wallpaper into the cabinet door panel, paste-side down and smooth out all of the air bubbles. Beginning at the center, run your hands along the paper towards the outside edges for a tight fit. Continue this process until all of the cabinet fronts have been wallpapered. If your cuts are not perfect, run paintable caulk along the edges of the panels. 5. Paint all of the newly-wallpapered cabinets and drawers with paint plus primer. Let dry and repeat on the back side. Paint the cabinet frames as well. 6. To give these cabinets some more characters and give them a country flair, we glazed them with dark antiquing glaze. We brushed it on with a paint brush, and then wiped it into the grooves in the bead board and cabinets with a damp paper towel. Using a wet paper towel gives you a bit more working time with the glaze, so don't skip that step! Let dry and then repeat on the cabinets frames. For around $100 and a lot of elbow grease, we transformed these dated oak cabinets into something straight out of a high-end modern country kitchen! Impressive!